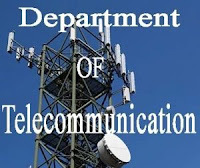 The Department of Telecommunications, abbreviated to DoT, is a department of the Ministry of Communications of the executive branch of the Government of India. Junior Telecom Officer (JTO): Applicants who have completed a degree and Must Working Under Central/State Govt. /BSNL/MTNL And Having Junior Telecom Officer Post on regular Basis OR Having JTO Post in BSNL/MTNL/ITI/TCIL or equivalent from a recognized Institute for DOT Recruitment 2018. Assistant Director: Applicants who have completed a degree and Must Working Under Central/State Govt./BSNL/MTNL And Having Assistant Director Post on Regular Basis OR Having SDE/Sr. SDE Post in BSNL/MTNL/ITI/TCIL. OR Having Post in PB2 With GP of 4600 in CDA With 5 Years of Experience in Related Grade or equivalent from a recognized Institute for DOT Recruitment 2018.